There are very few online casinos still operating which can offer you the benefit of over 15 years of experience, and one of them is River Belle Casino. Aussie players will love everything about this casino from the generous Welcome Bonus to the huge selection of pokies, free pokies and blackjack tournaments, and convenience of being able to play your favourite games on your smartphone or tablet. Don’t miss the boat! It is hard to imagine a more pleasurable activity than taking a leisurely cruise on a riverboat with a large casino. River Belle Online Casino replicates that experience from the convenience of your own home computer. But instead of ports of call, your destinations are the winning payouts you will be collecting on your favourite pokies and table games. If you are looking for a trustworthy online casino to play at, but are having trouble deciding because there are so many, RiverBelle Casino is certainly worth considering. Longevity deserves to be an important factor when picking an online casino because it is an excellent indicator that you are dealing with a company which acts responsibility and treats its clientele fairly. Otherwise, there is highly doubtful that it could stay in business with all the competition from other casinos. River Belle Casino was established in 1997 when online gambling was just getting started. So the fact that it is not only still around today, but is so highly regarded that it continues to attract and satisfy an international base of customers is amazing. Of course, an important factor contributing to this casino’s longevity is that, like any online casino that expects to succeed in today’s competitive market, it has kept up with the latest advances in online casino technology. From its inception, riverbellecasino.com has chosen one software provider, Microgaming, to power all of its games. Welcome Bonus has a hefty 50x bonus playthrough requirement for withdrawal. Blackjack advice on website includes incorrect and misleading information. Microgaming has been in business even longer than River Belle has (since 1994). But the company has maintained its position as a leader in its field by continually upgrading and enhancing its software, adding new games and introducing advanced customisable features to make playing online more enjoyable and more exciting. River Belle Casino players can enjoy the results of these innovations. RiverBelle Casino is a safe and secure online gambling site. It is owned and operated by Digimedia, licensed by the Malta Gaming Authority and a founding member of the Interactive Gaming Council. In addition, all of its games have been independently checked for fairness by eCogra. Since this organization’s monthly updated reports on average game payouts are published on the website, you can check this information for yourself. The eCogra seal of approval is only awarded to sites that meet the rigourous eCogra standards for security, integrity, fairness, and prompt payment. 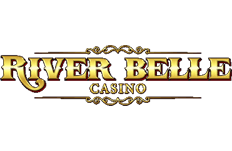 River Belle Casino download: Downloading only takes a few minutes and is the only way for you to gain access to all of this casino’s games. River Belle Casino flash version: If you prefer, you can choose the no download instant play flash version, which gives you instant access on any browser, but to fewer games. Mobile Casino: Surely, with your busy schedule, you would enjoy the extra convenience of being able to play some of your favourite games away from home, in which case the River Belle Mobile Casino is the perfect answer. Unfortunately, residents of the U.S. and UK are denied access to RiverBelle Casino. However, Australians are welcome aboard anytime. We think you will enjoy what this venerable but still exciting online casino has to offer. River Belle Casino, like any hospitable online casino, has a nice welcome aboard gift waiting for you as soon as you make the decision to sign up as a real money player. In fact, the River Belle Welcome Bonus is an especially generous one, up to AU$800. Of course, the casino doesn’t just hand you all of this money with no strings attached. First, you will have to open an account and make three separate deposits, all during your first week of play, since the bonus is not delivered all at once on day 1, but in three segments. In addition, each part of the bonus is subject to a specified minimum playthrough. Here is how the River Belle Welcome Bonus works. All games are permitted except: roulette, Sic Bo, craps, baccarat, table poker, Casino War, and Red Dog. However, only pokies (including progressives), keno, and scratch cards count 100%. Blackjack and video poker, which are the only other allowed games, count just 10%, except for classic blackjack and All Aces video poker, which only count 2%. All components of the bonus must be claimed within: 7 days of opening your account. As you can see, the wagering requirement of 50x the bonus each time is high. Furthermore, even though blackjack and video poker count towards meeting the bonus playthrough, the percentage they contribute is too negligible to be worth your while. For all intents and purpose, the bonus is for pokies only. All pokie games count 100%, even progressives, and since you probably love playing the pokies anyway, temporarily limiting your play to that game should not be a problem. The maximum bonus of $800 is a big one, but keep in mind that in order to quality, you will have to deposit a total of at least $1,900 of your own money, all in one week, and you will also have to give the casino $40,000 in action. Therefore, you should only take the maximum bonus if this level of play is within your budget. If not, you would be better off depositing less and taking a smaller bonus. The minimum deposit is only $10. The nice thing about this bonus is that the playthrough is based on the bonus only, not the bonus plus your deposit, which many online casinos require. Also, when all of the wagering requirements have been satisfied, your winnings, deposit, and the bonus money, too, are all available for withdrawal. Play at River Belle Casino with your AU$800 Bonus Now! Some online casinos apparently think that offering a Welcome Bonus is enough and afterwards unless you are a high roller, they can basically forget about you. At River Belle Casino, that doesn’t happen. Every time you play, you receive loyalty points which are your ticket, once you accumulate enough of them, for free casino credits to use on whatever games you wish. Depending on which games you play, 1, 2, or, or 3 loyalty points are earned for every $10 deposited and wagered. Traditional pokies, keno, scratch cards, and Sic Bo reward you with 3 points for each $10 wagered. Video and progressive pokies, roulette, Pai Gow, and Casino War reward you with 2 points for each $10 wagered. Video poker, blackjack, craps, and baccarat (which are the games with the lowest house edge) and, surprisingly, Red Dog, are worth only 1 point for each $10 wagered. Many online casinos not only have a structured loyalty rewards program with well-defined tiers, but also a special VIP program for their top players. We were therefore surprised that there was no mention of either on the riverbellecasino.com website. We would be remiss in this River Belle Casino review not to mention this limitation. The maximum bonus at this casino of $800 is contingent on depositing a total of $1,900 of the player’s own funds over the course of one week and then giving the casino $40,000 worth of action. If this level of play is not just a one-time gesture to get the bonus but representative of continued activity at the casino, it would be reasonable for the player to expect to be rewarded more generously than indicated. Elsewhere on the website it is stated that VIP players receive faster withdrawals. If there are other perks that are handed out, those need to be described on the website as well. Otherwise, with the exception of the big Welcome Bonus there doesn’t appear to be enough being offered to entice a high roller to join. On top of the loyalty points you pick up for all of your play in the casino, players who qualify based on their activity in the casino in preceding weeks are offered a percentage match bonus which can be redeemed any time between Thursday and Sunday. In addition, all players can take advantage of special themed monthly promotions, with the opportunity to win a coveted prize. Cash, off-line events, bonus credits, loyalty points, and free spins are the kinds of prizes up for grabs. Casino gambling always has an element of mystery and surprise to it, which is part of what makes it so exciting even though, unfortunately, you can never be sure if you are going to win. But if you are playing in a Microgaming casino, one thing you can be reasonably sure of is a tremendous number of games and, of course, lots of pokies. Combining quantity with quality is Microgaming’s specialty, and they are continually adding new games to their expanding repertoire, Accordingly, the statement in one part of the River Belle Casino website declaring that it is home to 350+ games is too modest. The actual number is over 400 and growing! Deciding which game to play first when you have hundreds to choose from won’t be easy. But if you are having trouble making up your mind, why not take advantage of the casino’s play for free option. If you like the game, you can then go ahead and switch from play money to real money. Let’s start with the pokies because we have a feeling those are the games you will be starting with, too, as soon as you make your first deposit. At River Belle Casino, you can indulge your love for pokies to your heart’s content because you can choose from more than 200 of them. You can play classic or reel online pokies, pub fruit machines, video pokies, MegaSpin pokies, and progressive pokies. The thrilling video pokie games are especially popular with online casino players and include such all-time favourites as Hitman, Hellboy, The Dark Knight, Tomb Raider, and Thunderstruck and Thunderstruck 2. But if you want even more action and excitement and chances to win, head for the MegaSpin pokies, which allow you to play multiple pokie machines at the same time. Some of the most popular MegaSpin games at River Belle Casino are Double Magic MegaSpin Pokies, Fantastic 7s MegaSpin Pokies, and High 5 MegaSpin Pokies. Last, but certainly not least, on those days when you're feeling especially lucky, look no further than the progressive pokies. River Belle Casino gives you a choice of 15 pokies with a progressive jackpot, all part of Microgaming’s multi-casino shared jackpot network, so the top prizes are incredible. One player won €6.4 million at River Belle Casino playing Mega Moolah. Maybe Lady Luck will shine brightly on you, too, and make you the casino’s next multimillionaire! Alternatively, you might want to try your luck in a weekly free pokie tournament. Winning won’t make you a millionaire, but with up to $30,000 up for grabs each week and no cost to you, it is certainly worth a shot. Take your pick of either a scheduled tournament or a Sit ‘n’ Go. Players who qualify by their standing in the tournament or who buy in can also play in the $20,000 main tournament. Since River Belle is a full service online casino, pokies are only one of many types of games that are offered. Whenever you are in the mood to play something else, no problem. Video poker, blackjack, roulette, baccarat, craps, table poker, Sic Bo, Red Dog, Casino War, keno, and scratch cards are all available. In addition, some of these games are offered in many different variations, so you can try different ways of playing that you might have never experienced. American, European, and French Roulette are offered in both the downloaded and instant play casinos. However, we suggest you avoid American Roulette because the 00 makes the house edge higher. Other roulette games you can also play in the downloaded version of the casino include European and French Roulette Gold and the progressive game Roulette Royal. If you wish, you can follow the continually updated stats being provided on which numbers and side bets have been the “hottest” (but the information won’t help you win since each spin is independent). But wait: if you love roulette and want still more roulette action, you have it. The instant play casino offers the exciting opportunity to play live dealer roulette! If you think the roulette options are a lot for an online casino, wait till you see what River Belle has to offer blackjack players. Most, if not all, land-based and riverboat casinos and many online casinos offer at most just a few ways to play blackjack, but at RiverBelle Online Casino, you can choose from more than 40 variations of this popular game! If you would like to put your skills and luck to the test playing Classic Blackjack, Atlantic City Blackjack, European Blackjack, and Vegas Strip Blackjack, along with many more versions of blackjack, this is definitely the place to do it. Blackjack is a game where rules matter, however, and different variations can be more or less favourable to the player. Following the correct basic strategy is important, so while we commend this casino for making an effort to present their version of tips and strategies for the game, some of the information is both erroneous and confusing. For example, the “basic strategy” tables posted on the site advise you to either or double down or hit in situations where the correct basic strategy is always to double down. Many players hit instead of double to conserve money when they are low on chips, but the correct thing to do if not properly funded is to play for lower stakes. There are excellent references you can consult which will properly explain what you need to know. Also, it is not clear why there would be an extensive discussion on card counting. Online casinos shuffle the cards after every hand, making card counting pointless. Blackjack tournaments with guaranteed prizes are another exciting option that River Belle Casino offers. Players are assured that “card counters are welcome,” not only for the regular blackjack tables, but also for the tournaments. Of course, card counters are welcome because the continuous shuffle negates any advantage, and if you deviate from basic strategy based on the presumed but incorrect count, it will actually work against you rather than for you! As with the slot tournaments, the blackjack tournaments include both freerolls (scheduled daily) and regularly scheduled and Sit ‘N’ Go qualify or buy-in tournaments. Seven players are seated at each table. We already mentioned the live dealer roulette games. You can also play blackjack and baccarat with a live dealer. These games are like no other because they combine the exciting atmosphere of a real casino with the inmatched convenience of playing online. The secret is state-of-the-art video streaming technology. Online casino live dealer games are as close as you can get to playing in a real brick and mortar casino without actually traveling to one. A good indication of whether an online casino is keeping up with the times is its mobile platform. So you will be pleased to know that RiverBelle, despite its 1997 launch, now offers mobile play as an option. Many online casinos have a mobile app for Apple iOS devices (iPhones and iPads) and possibly a second app for Android devices. However, these apps are highly specific, and unless your device is a perfect match for the app, you won’t be able to use it. At River Belle Casino, you are unlikely to have a problem because most currently used smartphones and tablets, including not just iPhones and iPads, but also Android, Blackberry, and Windows, and more are all supported. Before you start playing, you should use the device check feature to make sure that the game you wish to play is compatible with the make and model of your mobile device. Customer Support and help if you if you are still uncertain. You won’t be able to access all of the games on your mobile device. However, some of the most popular pokies games are included, like Tomb Raider, Break da Bank Again, and the progressive games Mega Moolah and Major Millions. Other games besides pokies are also offered. For example, you can play blackjack, Jacks or Better video poker, Royal Derby, and American and European roulette. All of the River Belle mobile games, just like all of the online games, are powered by Microgaming software. Keep in mind that the mobile game offerings are pared down versions of the original games. They retain the basic elements of the original, but the graphic resolutions and sound effects have been adapted specifically for mobile devices. The rules and special features might vary slightly, too, so it is a good idea to read all of the descriptive information provided before you start playing. The number of games varies depending on the type of type of device. However, new supported games are continually being added. River Belle mobile players are offered the same bonuses and promotions as desktop players. In order to play the RiverBelle Casino mobile games, in addition to making sure that your device is compatible, you need to have an account with the casino. If you have not yet set up an account online, you can do so on your mobile device and receive the same generous Welcome Bonus that you would otherwise receive on the computer. If you already have an account for online play, you can use that same account to play on your smartphone or tablet. Another convenient feature is that just like on the computer, you have a choice of two ways of accessing the mobile games. In order to get started, log onto http://www.riverbellecasino.com/mobile-casino/#. Then you can either follow the instructions for downloading the app onto your mobile device or skip the downloading process and play the game of your choice directly in your mobile device web browser. You can use the mobile device to make deposits and withdrawals. The River Belle Casino mobile platform is completely secure so you have nothing to worry about. Mobile players receive the same bonus offers and promotions as desktop players. RiverBelle Casino has a reputation for super fast withdrawals. We find in our review that most withdrawals at this casino are completed within 48 hours, even faster for VIPs. Besides AUD, other accepted forms of currency include USD, CAD, EUR, and a few others. Regardless of how you decide to do your banking, www.riverbellecasino.com takes its responsibility to protect the privacy and security of your account very seriously. The casino’s use of the latest advances in encryption technology assures you that you have nothing to worry about. The Customer Support team at River Belle Casino is available 24/7 via live chat or phone to answer any questions or concerns you may have. Support via email might be an option as well. However, no address for email support is included on the website. Customer Support is offered in the following languages: English, French, German, Italian, Spanish, and Swedish.